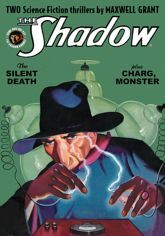 First, as he tracks the scientific mastermind behind a deadly plague, The Shadow becomes the target of "The Silent Death." Then, the Dark Avenger follows a trail of brutal killings as he closes in on the sinister sanctum of "Charg, Monster" in a thrill-a-minute pulp classic! BONUS: A Supersnipe classic from the Golden Age of Comics! This instant collector's item showcases the original color pulp covers by George Rozen, interior illustrations by Tom Lovell, and historical commentary by Will Murray.